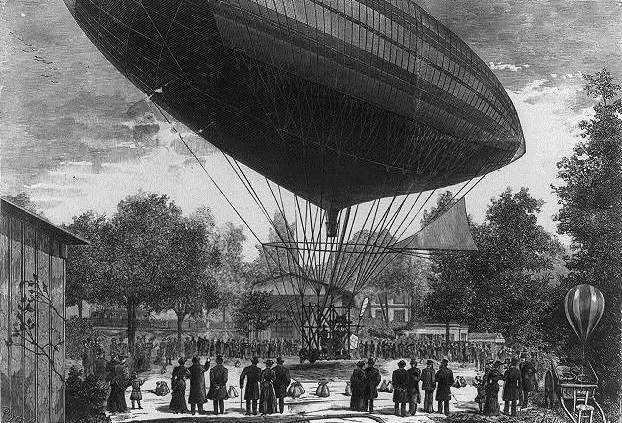 8 October 1883: The first airship powered by an electric motor was flown by brothers Albert-Charles Tissandier (1839–1906) and Gaston Tissandier (1843–1899) at at Auteuil, a suburb of Paris, France. 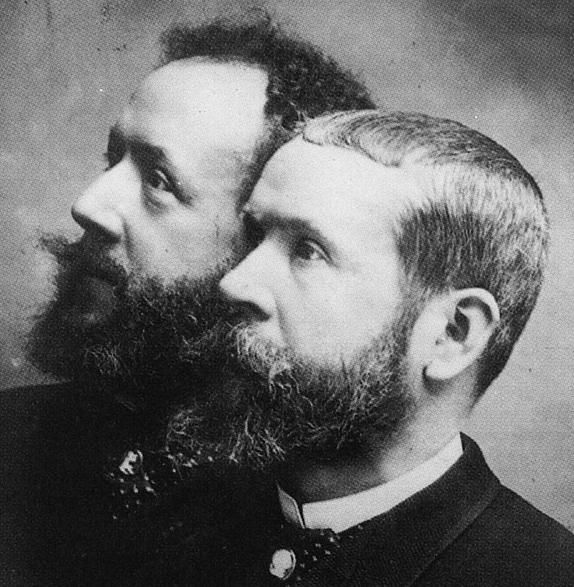 The brothers were experienced aeronauts, having designed and built a number of balloons. From the end of September the gas apparatus was ready to operate., the balloon was stretched out upon the ground, under a long movable tent, so that it could be at once inflated; the car and motor were stored away under a shed, and my brother and I awaited fine weather in order to perform our experiment. On Saturday, the 6th, a high barometer was noted, and on Sunday, the 7th, the weather became fine, with a slight wind, and we therefore decided that the experiment should be made the next day, Monday, October 8. The inflating of the balloon was begun at 8 o’clock in the morning, and was continued uninterruptedly until half-past two in the afternoon. This operation was facilitated by the equatorial cords which hung from the right and left of the balloon, and along which were let down the bags of ballast. These cords are shown in Fig. 2, which gives a front view of the balloon. The aerial ship having been completely inflated, the car was at once fixed in place along with the ebonite reservoirs, each containing 30 liters of acid solution of bichromate of potash. At twenty minutes past three, after piling up the ballast in the car and balancing the latter, we slowly ascended into the air through a slight E.S.E. wind. At the surface the wind was nearly null, but, as frequently happens, it increased in velocity with altitude, and we ascertained by the movement of the balloon over the earth that it attained at a height of 500 meters a velocity of 3 meters per second. My brother was specially occupied in regulating the ballast in order to keep the balloon at a constant altitude, and not far from the surface of the earth. The balloon hovered over the earth very regularly at a height of four or five hundred meters. It remained constantly inflated, and the gas in excess escaped through expansion by opening, under its pressure, the lower automatic safety valve, the operation of which was very regular. . .
At thirty-five minutes past four we effected our descent upon a large plain in the neighborhood of Croissy-sur-Seine, where the maneuvers connected with landing were performed by my brother with complete success. We left the balloon inflated all night, and, on the next morning, it was found not to have lost the least quantity of gas, but was as fully inflated as on the preceding eve. . . . 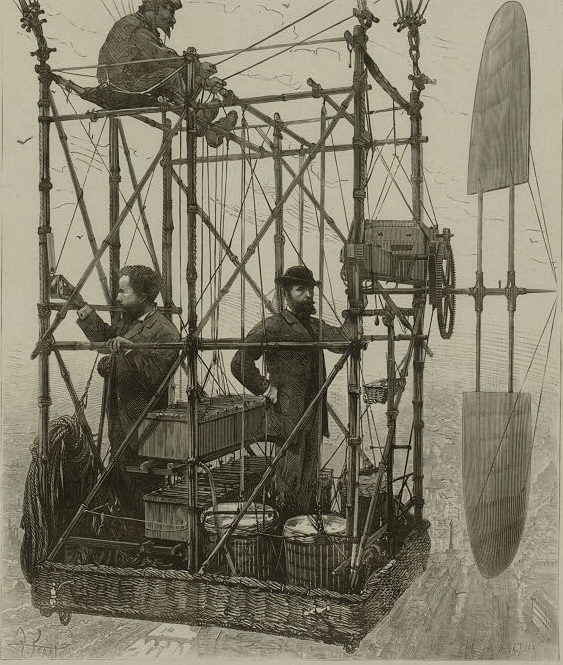 The Tissandier brothers’ dirigible was the first to be powered by electricity. A 1.5 horsepower Siemens electric motor, turning 180 r.p.m., drove a two-bladed propeller through a reduction gear, producing 26 pounds of thrust (116 newtons). 24 bichromate of potash (potassium bichromate) cells provided electricity for the motor, which propelled the airship at 3 miles per hour (4.8 kilometers per hour). The airship was 28 meters (91 feet, 10 inches) long with a maximum diameter of 9.2 meters (30 feet, 2 inches). Its gas capacity was 1,060 cubic meters (37,434 cubic feet). The total weight of the airship, with “two excursionists,” instruments and ballast, was 1,240 kilograms (2,734 pounds). “. . . It was constructed by Mr. Albert Tissandier, who very happily replaced the usual netting by a suspension covering formed of ribbons sewed to the longitudinal elliptical strips, according to the geometrical diagram. This suspension covering is fixed upon the sides of the balloon to two flexible rods which accurately adapt themselves to its form from one extremity to the other, and keep the entire affair in shape. To the lower part of the suspension covering there is attached a netting that terminates in twenty suspension ropes which support the car by its four upper corners.